The gay Azerbaijani artist Babi Badalov today received notice that he has been granted asylum by France, just over five years since he first fled for what he thought would be the sanctuary of the UK. Badalov is an internationally renowned radical artist and poet whose work has been exhibited across Europe. It has been explicitly critical of the Azerbaijan government and prominent members of the present and past regimes there. His art and open homosexuality led to him suffering beatings and bullying over the years that left him with only eight teeth remaining and a number of mental health problems. “I tried to exhibit my work called ‘Mister Musor’ [Mr. Garbage] a few times, where I am standing on a heap of garbage in Lenin’s pose." Homosexuality remains an extremely taboo subject in Azerbaijan, which is 99% Muslim. This led Badalov’s brothers to threaten to kill him because of the shame which he has brought on the family. 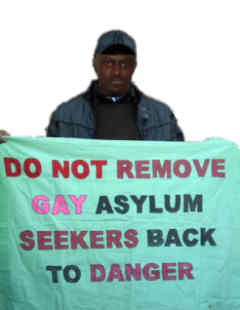 He was violently removed from the UK in 2008 after his asylum claim was rejected by then Home Secretary Jacqui Smith on the basis that he could go and live in another part of the country and keep his sexuality a secret. He hid underground in the Azerbaijani capital Baku for two days after his sister had warned him over the phone before his removal to never to come to the country again because of death threats from his brothers. As a result Badalov fled to St Petersberg. In St Petersberg, growing nationalism and increasing attacks on people from the former Soviet republics meant that Russia was not safe for someone from Azerbaijan, particularly because of Badalov's politically conscious art and because he is openly gay. Badalov had first moved to the Russian cultural capital in 1980 and he was one of the best-known artists in the St. Petersburg independent art scene centered at the Pushkinskaya 10 art squat in the 1990s. “When Russia opened up and the Soviet Union broke down, we became interesting,” he said. After writing a poem about Anna Politkovskaya, the Novaya Gazeta journalist and persistent critic of the Kremlin’s politics who was shot to death in Moscow in 2006, he received threats from unknown men in the street, who told him that he should leave. “These ‘New Russians’ emerged; it became scary to go out on the street. I got scared and ran from Russia,” said Badalov. Badalov first moved to Turkey, but could not put down roots there. He then moved back to Azerbaijan, where his life soon became intolerable. Family pressure led to him marrying. His homosexuality and his art led to violence and harassment from family and the authorities. In 2006, he was invited to do a workshop as part of an international art program for two weeks in Oxford, England. With a British visa already in hand, he decided to move to the UK for good and claimed asylum. Moved by authorities to the Welsh capital, he became a well-known fixture on the Cardiff art scene. His popularity led to a major campaign in his defence after his asylum claim was rejected. This campaign proved unsucessful and his removal went ahead despite a comittment to the activist Peter Tatchell by then Labour government ministers Harriet Harman and Barbara Follett to establish a mechanism whereby "I could report abuses and you would take action to put them right." "Deporting Mr Badalov back to Azerbaijan was heartless and reckless. His life is now in danger," Tatchell said at the time. "Babi was deported, despite being in the process of filing a new asylum claim with fresh evidence. This new evidence includes threats to kill him on the grounds that he had bought shame to his family by being gay. There are also new witness statements detailing Babi's history of homophobic persecution in Azerbaijan." "The Azerbaijani police are unable to protect him." "In these circumstances, his removal should have been put on hold until he had an opportunity to put forward his new evidence to an asylum tribunal." "I do not know or understand why you apparently ignored my request and sat on your hands, but it looks like a betrayal of the trust and commitment that I thought we had established." Deodorant For Turkmen, 2008. Image via Wikipedia. After moving from St Petersberg to Paris in 2008, Badalov's asylum campaign received the support of the French LGBT asylum organisation Ardhis (Association pour la Reconnaissance des Droits des personnes Homosexuelles et transsexuelles à l'Immigration et au Séjour / Association for the recognition of the rights of the homosexual people and transsexuals to immigration and the stay). "It was one of fantastic happy news in my life. I screamed, cry and I was floor post office. I was out of control of such happy moment in my life, which I wait for it almost 5 years." "I thanks OFPRA and to all friends which was next to me help to me. Very specially thanks to ARDHIS, they help me a lot of sad period of my life."